A very easy dish with only 4 main ingredients, this Fish Cake is great for people who work out and need a high-protein low-fat boost, or for young children and the elderly. It is full of nutrients and very healthy. 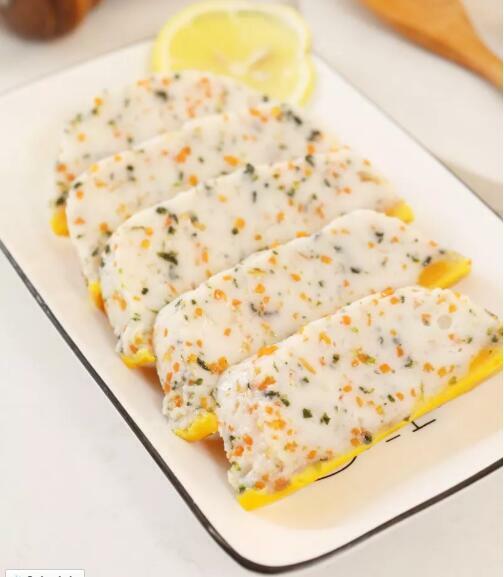 China’s Hubei Jingzhou Fish Cake is a famous dish in Jingzhou, Hubei Province, and one of the top most well known dishes in Hubei. The fish cake is made using the whole fish, including the roe. It is very fresh and tender, delicious and nutritious, and suitable for all ages. When I say all ages, I even mean if you have a baby at home! Fish is rich in high-quality protein, and nutrients and a great transition from milk or formula to more solid foods. The fish cake recipe I have prepared for today has been of great success for me and is very easy to do. I add carrots and seaweed for extra flavor and nutrients as well. Step 1: The fish is cut into strips. Longli is a high-protein, low-fat, low-calorie fish. The flesh of the fish is fresh and tender, and the taste is smooth. Every 100 grams of Longli fish has an unsaturated fatty acid content of 54%, which promotes health. Metabolism and decomposition of fatty acids in the body can also reduce the body’s absorption of cholesterol, prevent obesity, and reduce cardiovascular and cerebrovascular diseases. Step 2: Carrots and seaweed are finely chopped. Step 3: Separate egg whites and egg yolks. Step 4: Pour the fish into the cup of the juicer and add the egg white and a little water. (If you don’t have that or similar product, you can use a food processor and run for a bit longer). Step 5: Process the fish into a paste. Step 6: Empty into a large bowl. Step 8: In a smaller glass bowl, brush some olive oil around the bottom. Step 9: Pour the freshly mixed fish paste and flatten it with a spoon. Step 10: Steam for eight minutes at high heat. Step 11: After eight minutes, open the lid and pour the egg yolk into the surface of the mud. Step 12: Cover and steam for another five minutes. The delicious fish cake is ready! 1. If the fish cake does not form correctly, you should use less water when adding the egg whites in step 4. Also, use less carrots and try your best to cut them into small pieces, as they don’t assist with the forming process. 2. If the baby is allergic to the egg, you can not add it, just add a little water to replace it. Mix for longer if this is the case. 1. It keeps the body in great shape: fish + eggs steamed the healthiest, low-fat content, full of protein. Great for people who often work out. 2. It is great for young children and the elderly as it is high in protein, low in fat, soft, easy to digest, and full of nutrients. Egglettes Review – Do Egglettes Work?